Darld Brannan (left) poses with retired Col. Thomas Fitzgerald (seated) and Fitzgerald's daughter, Sarah, following the pining ceremony. Photo courtesy: Providence. Darld Brannan has been a volunteer with Providence SoundHomeCare and Hospice for more than a year. He’s a veteran who understands the special needs of vets who are on hospice. 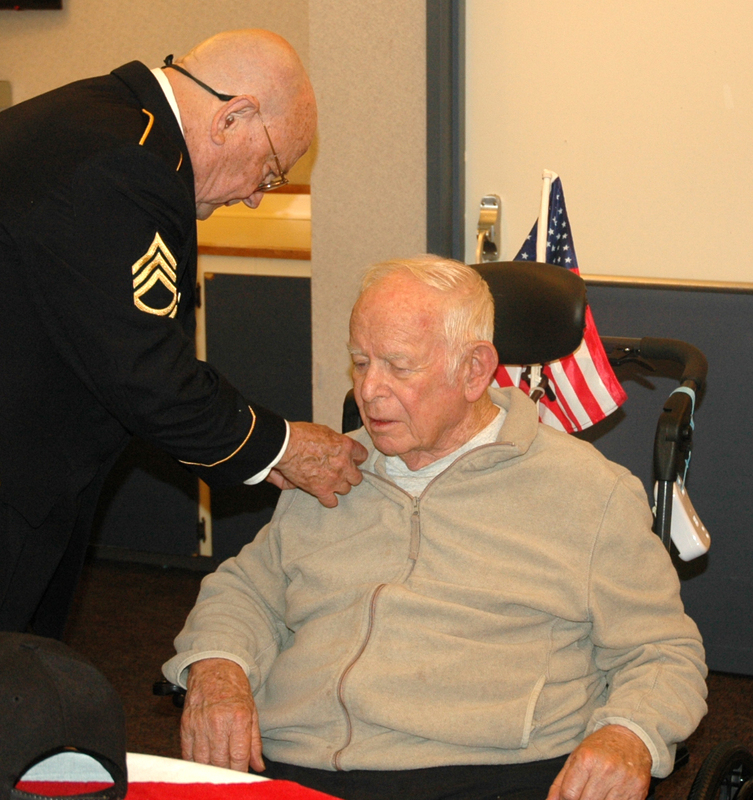 Brannan is a member of the Providence We Honor Vets program, designed to extend simple acts of gratitude, honor and companionship to veterans in Providence’s care. Darld Brannan completed a pining ceremony for retired Col. Thomas Fitzgerald. Brannan is a volunteer with Providence SoundHomeCare and Hospice. Photo courtesy: Providence. The offerings are customized to the patient, based on his/her preferences. “Gestures can be very meaningful to all vets, and particularly for those who were never truly ‘welcomed home’ from combat, thanked for their sacrifice, or felt honored for their service to our country,” said Opstedal. Earlier this year, Brannan was matched with retired Col. Thomas Fitzgerald, who is a Providence hospice patient living at a local skilled nursing facility. 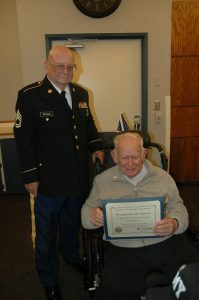 The pining ceremony for retired Col. Thomas Fitzgerald included a certificate, reading, pin, and salute. Photo courtesy: Providence. A “pinning ceremony” was held. This is a formal honoring of the veteran, thanking them for their service on behalf of Providence SoundHomeCare and Hospice. It includes a reading, a certificate, a pin and a salute. 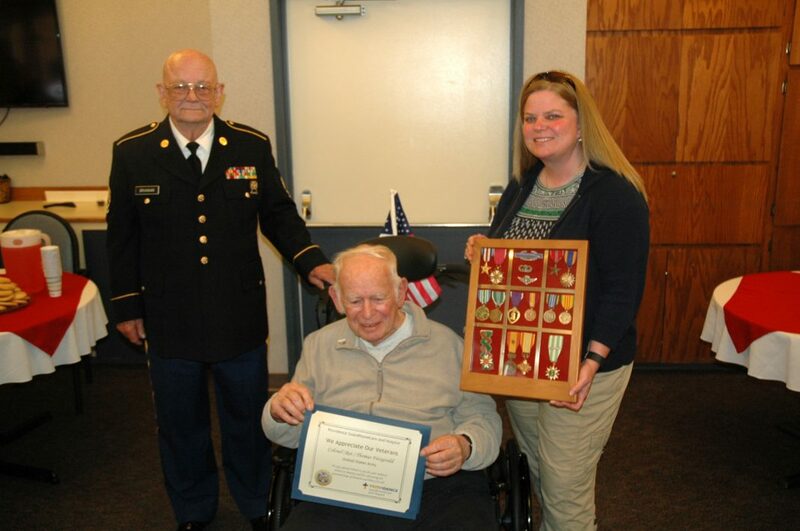 Col. Fitzgerald, family and the nursing home staff were able to share some of his history and medals he had received with the Providence team. Brannan is one of 16 veteran volunteers and more than 110 active volunteers of the Providence SoundHomeCare and Hospice team who help support patients and families (both in patient care and through grief support services) in Thurston, Mason and Lewis counties. 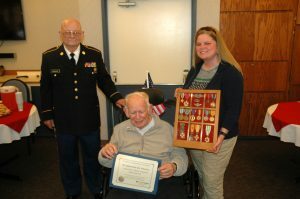 Darld Brannan (left) poses with retired Col. Thomas Fitzgerald (seated) and Fitzgerald’s daughter, Sarah, following the pining ceremony. Photo courtesy: Providence. He is also an active volunteer at Providence St. Peter Hospital and other community organizations. For more information about hospice services and Providence SoundHomeCare and Hospice in Thurston County, you can see a list of Frequently Asked Questions. Providence SoundHomeCare and Hospice is located at 3432 South Bay Road NE in Olympia. You can call them at 800-869-7062.